Leonard’s Palazzo hosted my wife and I’s wedding on April 2019. The Venue has an eye catching curb appeal. Every detail inside the venue gives a luxurious essence and provides for great photos. Most importantly, the price is very reasonable considering the overall perks offered here. Our experience from the beginning, was centered around my wife and I’s preferences. Jay was our banquet manager. Jay was professional, empathetic and accommodating. I was extremely impressed by how he turned roadblocks into a positive experience for us. He has an art of dealing with clients which was rooted in trust. I believe, after viewing multiple venues, that this not easy to find. He is an all around, excellent banquet manager, and human being. The day of my wife and I’s wedding, every employee at Leonard’s were so polite. We heard so many positive feedback from our guests. Many of them were so impressed that they too would like to do some business with Leonard’s. If you are looking for a blend of luxury, great customer service and at a reasonable price... look no more and come see Jay at Leonard’s Palazzo. You will not regret it!! 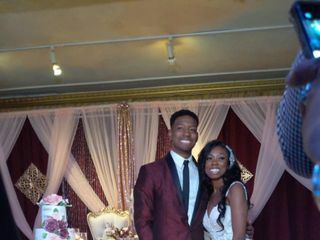 My husband Joshua and I got married at Leonard's Palazzo on March 24th 2019! 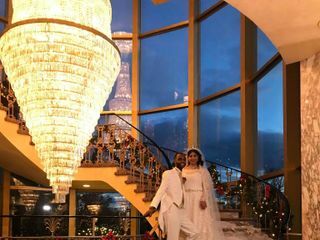 Leonard's Palazzo was probably our 6th or 7th wedding venue we visited and after meeting with Jeffery Edmonds, our search was over! We literally came back a week later to lock in our wedding date! I can honestly say there was not one flaw in that wedding venue; the ceremony rooms are beautiful, the cocktail hour rooms are spacious as well as the reception rooms! There's a large parking lot for guests, the venue is handicap accessible and has outdoor space for an outdoor ceremony, cocktail hour and lounging! Jeffrey Edmonds was an amazing host! He's funny, he's honest and we definitely connected with him! He reassured us that he was always available if we had any questions or concerns and he definitely was!! The day of our wedding EVERYONE WAS PRESENT, ATTENTIVE AND FRIENDLY!!!! I couldn't be more pleased with the service!! Even our guest expressed how immaculate the building and service was! The food was so delicious; cocktail hour and dinner!!! Even with our wedding being on a Sunday no one wanted it to end! My reception was held at Leonard’s on March 23 and special thanks to Ryan it was simply amazing! From start of the process to the day, he made it so effortless. I never was overwhelmed or stressed he took care of everything! There was not 1 thing out of place or missed.. along with this Leonard’s is absolutely beautiful. We are so happy we chose Leonard's to have our wedding ceremony and reception. The entire staff from start to finish was amazing. Eric was superb. He was very helpful throughout the entire process. He is always warm and welcoming. Our Maitre'd Jose and bridal attendant Racquel made sure our wedding day ran smoothly. Everyone raved about the food! I would definitely recommend this venue for other couples searching. Thank You to Leonard's for providing me the greatest experience. Thank you Danielle for being in constant contact with Jewels to make my dream wedding come true. From the first day I walked into Leonard's I knew it was the place I had been looking for. Even though we live in Jersey no one gave us the customer service you guys provided. Also a big five stars to Michelle (Maitre D') and the other two Angels (sorry their names slipped my mind) who were there for whatever I needed and they helped make my event planner's job easier as they were in constant communication. Leonard's you're the best! Amazing amazing staff! First off a big shout out to Ryan and his team. The bridal attendants, the maitre'd, the wait staff were all great. Our wedding went through flawlessly without any problems. We had some family drama and the staff in all their power helped remedy the situation. From when our bridal party arrived all the way to our extended venetian hour, they were all A++. We have gotten so many compliments on how nice the venue looked, how good the food was, and how great the staff performed. My husband and I celebrated our 40th wedding anniversary here last Sunday. This place was so wonderful that I can’t say enough! The service was topnotch! Ryan, our coordinator, was always checking on us to make sure things were good. Didi, Raquel, and especially Jennifer all went above and beyond my expectation. Everything was well coordinated. Didi was a huge help in getting us organized for the wedding rehearsal and making sure our reception program ran smoothly. Jennifer was always there whenever we needed something. The bridal suite was great...drinks and food was brought up for us (although we had no time to eat)... the room was always secured...they even had a security lady who kept the room lock whenever no one was there. And wow, the food was absolutely delicious. Just as we were worried about how we would get everything home, the three wonderful ladies had already packed everything up for us on two carts, wheeled them out and put everything into our cars. We were treated like royalties! WOW WHERE DO I EVEN START!!!!!!!!!!!!!!!!!! LEONARD'S PALAZZO WAS AMAZING!!!!!!!!!!!!!!!!!!!!!!!!!!!!!!!!!!! OUR WEDDING WAS EVEN MORE THAN PERFECT. WE GOT MARRIED ON 11/10/18 FROM THE START RYAN WAS OUTSTANDING!! IF YOU GO TO LEONARD'S YOU MUST AS FOR RYAN! HE TRULY MADE EVERYTHING PERFECT. FROM THE STAFF, THE FOOD, THE BARTENDER, THE MAITRE D, THE ATMOSPHERE EVERYONE WAS BLOWN AWAY WITH THE EXCEPTIONAL SERVICE!!!!!!!!!! OUR WEDDING WAS EVEN MORE THAN I EVER IMAGINED. Ryan was extremely courteous, responsive, and experienced when it came to him helping plan our perfect wedding. He went above and beyond to make sure all my requests were taken care of months, weeks and days in advance. He is an absolute pleasure to work with, and we would HIGHLY recommend Leonard's alone for the experience of working along side of Ryan. The venue itself is GORGEOUS!!!!!!!!!!!!!!!!!!! The food is amazing!!!!!!! All of the help we received once we walked through the doors. The Maitre D was there and made us all feel so comfortable. She was there by my side the whole night which made everything soooooo much easier!!!!!!!!!!!! !Hosting our wedding at Leonard's eased many of the stress points that come with the wedding planning process - if you are considering to host your wedding or any event at Leonard's, I highly recommend it!! You will be amazed if you do! I don’t even have enough words to describe my happiness and how my wedding was even better than my dreams. LEONARD’S PALAZZO IS ON POINT AND THEY KNEW EXACLTY WHAT TO DO WHEN IT COMES TO MAKING YOUR EVENT PERFECT, YOU WILL NOT BE DISAPPOINTED!!!!!!!!!!!!!!!! !TRUST ME IT WAS THE BEST DECISION WE EVER MADE!!!!!!!!!!!!!!!!!!!!!!!! Ryan will do anything for his bride and groom! We worked with Ryan for our Nov 10th wedding and he was nothing short of professional,funny,punctual,respectful and informative. He was literally our easiest vendor to work with! He made our visions come to life. He never gave me NO as an answer, he looked into it,answered my questions and ultimately made it happen! He knows his stuff, just put your trust in him, I promise he will not disappoint!!! My husband and I just had our wedding at Leonard’s and he was absolutely perfect!! The staff was amazing and helped me with whatever I needed! The room was gorgeous! Absolutely stunning and just renovated which was breathtaking! Thank you all so much for helping make our special day amazing and everything we hoped and dreamed out!!! 100% fantastic! Our wedding could not have been more perfect! The entire staff are the utmost professionals and so respectful, helpful, polite, courteous and friendly. We booked an appointment based on 2 recommendations. We met with Ryan and he was a doll from the start. He gave us plate after plate of food while we there (and every time after that) and gave us a detailed tour. We went the next day with our deposit. From that day it was even more smooth sailing. Ryan scheduled a tasting (we even requested one of the waitresses, Diana, as one of our bridal attendants for the wedding) for my husband and I and our parents, a rehearsal (ceremony was on site) and respected our wishes of not wanting to see each other before the ceremony. Our maître d’ was Jose and he was amazing! We decided to move the ceremony inside because it was the one day in October the temperature dropped to 48. At one point during the reception, I wanted to remove a layer of my dress that comes off; it kept falling and getting in my way. One of my bridesmaids and I went to the suite and I forgot the door stays locked. I went to turn around to find someone and Jose was right behind me, appeared out of thin air. He laughed and said “My job is to know where you and Mr. Christopher are at all times.” That speaks volumes. Top notch at his job. The bridal attendants went above and beyond. We had Diana and Rina. Both helped our amazing photographer and really catered to my whole bridal party and families every need. They went above and beyond. Our reception room literally made me cry. My husband and I worked so hard to make it a fall theme with pumpkins, leaves, etc. The way they displayed and decorated and the lighting, the cake display, I literally hugged them and cried. It was a dream come true. The whole experience at Leonard’s was truly amazing and I wouldn’t change a thing, except it was too short! Love to Leonard’s! Thank you! We just had our wedding at Leonard's this past Friday. It was absolutely AMAZING! From beginning to end, their team was with us all the way in order to make our day everything we ever wanted. And not to mention the food! All our guests raved about the food! For the day of, the bridal attendants were great and so attentive. Would not want our wedding anywhere else. My husband and I just had our wedding there on Saturday, October 6th 2018, and all I can say is THANK YOU. Ryan, you have been the most amazing, genuine and patient person through this process and made this entire planning an ease. Your level of professionalism and amazing attention to detail, were WAY BEYOND our expectation. I am not sure if I am being biased, but our wedding was PERFECT and there is not one thing that I would change from Saturday. You and the ENTIRE staff on deck Saturday, made our wishes come true. From the bridal attendants to our Matire'D, to the waitstaff and crew, the bartender, valet and EVERYONE, you literally blew us away. My parents were at ease and all my friends and family were blown away by the cocktail hour, the dinner and the venetian hour. Thank you Leonards for making our wedding dreams come true. This was a true night to remember. My husband & I were exited on our wedding day. Thank God we chose Leonard's , Mr Ryan was the best we could have ask for . He answered all my questions every time I contacted him. I really felt like a princess on my wedding day, thank you so much Mrs Ryan. My husband & I will always remember you. I had my wedding at Leonards and it was absolutely amazing. Ryan helped me set everything up. Me and my husband really loved him. Our wedding came out great and they really exceeded our expectations. The food was great and the staff went above and beyond making our day special. The three ladies (which I think were all bridal attendants) were the best! I wish I could remember there names. Every single detail was executed perfectly. I could not be more happier with how Leonard's treated us. I wouldn't change a single thing if I could I'm so happy I picked them as my venue! All my guests all loved it all well, and I look forward to doing more events at Leonard's in the future. Will have every party here for the rest of my life. We seriously cannot say enough good things about Leonard’s Palazzo. The care, hard work, organization, and all-around positive energy of everyone who works at Leonard’s went unmatched by any other venue we looked at, and we plan to hold every major family party at their establishment for as long as we live! We owe it to Leonard’s, and to all the couples reading this, the full story of why. Originally, my now-husband and I were booked with another venue, we’ll call them venue “X”. After a series of AWFUL customer service situations with venue X, we started getting the feeling that something was wrong. We also started hearing rumors that the venue was closing, and I started to panic. Having already put down our deposit and a few first payments, I immediately asked the Senior Banquet Manager there for a meeting with the venue’s owners, to ensure us that nothing was wrong, and we did not have to worry about any potential abrupt closings of any kind. We were given the run-around, told that they were “trying” to set up the meeting but just could not get a hold of the owners. This went on for over a month. Finally, my husband and I had just about had it. We told the venue we were pulling out, and we demanded our money back. We told them we were leaving because we knew they were lying to us about something and we just did not feel comfortable staying. They REFUSED to give us ANY money back, but we decided to leave anyway since we did not want to have to worry and feel anxious for the next 6 months or so that something might be wrong. My husband and I were now back at square one, in the negative. With only a few months left till our wedding, we began our venue search AGAIN. When we finally stumbled on Leonard’s, we were met with UNPARALLELED service. Right away, I knew this was the venue for us, when the banquet manager there named Ryan, called me on his day off, kids screaming in the background, telling me he had heard about our predicament and wanted to help. It was clear he genuinely cared. 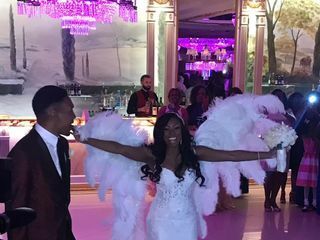 This was more than just potential business for him, this was a chance to help out a panicked bride and turn her awful wedding planning story into the most magical one. And he did just that. After giving us a fantastic rate, in their largest room (which, they thankfully had available on our originally chosen wedding date), we booked with Ryan and Leonard’s and never looked back. Every request we had, Ryan and his staff met. The food was EXCELLENT, the day-of staff were excellent, the space was beautiful, clean, and lively. 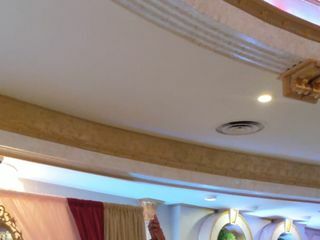 Our room had a giant bar, so no one ever waited more than a minute for a drink. Ryan even stopped by the reception on our wedding day, and our picture with him is one of our favorites because of all the love and care this man put in to making sure our day was special. And it was most certainly a special day. Oh, and by the way, shortly after we left our first venue, they announced they were closing and are no longer in business. I had my wedding reception at Leonard's Palazzo and it was absolutely beautiful! I worked with Ryan Matland and he was super responsive, accommodating and was very flexible. Cocktail hour was amazing! The team at Leonard's was very professional. Wendy, the bridal attendant was awesome and was so helpful on my wedding day. Natalia was great and made sure everything was to our liking. I had absolutely the best night ever and my guests were very impressed with the venue and level of service. Leonard’s Palazzo is the best venue in LI. The venue is breathtaking. The food was excellent. The staff were the best. They made me feel like a queen for my special day! Ryan went above and beyond to make sure everything was perfect! My guest are still raving about how beautiful the venue looked and the delicious menu! Strongly recommended! Originally when I first came into Leonard’s Palazzo, I sat down and worked with Joseph. He was an absolute pleasure to work with. Unfortunately, he left and Ryan took over my event 3 months before my wedding day. I was very stressed and overwhelmed however, I was very fortunate that Ryan took over without any problems and made sure everything went smoothly. He was extremely helpful from the moment we sat down with him up until the very end. He did an amazing job and made sure my event was almost entirely gluten free. They even provided me with a gluten free groom's cake so my family members can have gluten free wedding cake as well! I have celiac disease and so does my family. The food was absolutely delicious and none of my guests realized they ate gluten free food. Everything was absolutely perfect. Ryan was amazing! My wedding day was absolutely perfect! The food was unbelievable, the staff was amazing and everything was perfect. It has been a week since my wedding day and my guests are still reaching out to me about how incredible my wedding was. The servers at each table were very attentive and helpful to my guests, the bartenders were fantastic and the food was outrageous! I couldn’t have asked for anything better! The bridal suite staff was amazing. They made me feel so special and important on my wedding day. They ran around and got me everything I needed no questions asked. I couldn’t have asked for anything more. The food was incredible, my room (The Da Vinci Room) was stunning and the staff went above and beyond for my guests. Everything was stunning, absolutely amazing!!! The only word of advice I have for future brides… make sure you check your cake topper before leaving the venue. I was heart broken to see someone dropped and broke mine when they cut the cake. I found out when I returned home and took it out of the original packaging. A Fairy-tale- Service & Quality Unmatched!!! The team at Leonard's was amazing!! The service and value at here is unmatched. 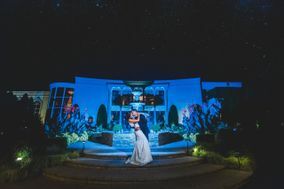 It was the first and only venue in the Long Island area from our list that my Fiance and I visited. We were sold from the first visit. Jay was awesome, and made us very comfortable. He was straightforward and answered all our questions. Ryan, the director of catering was like no other. He was very accommodating, responsive, and so easy to deal with. Considering we were planning the wedding from out of town, Ryan and the LP team could not have made the process any easier. The service provided to us, and our guests the day of, was truly of excellence. The food, lighting and ambiance were top notch. Our guests had a great time! I am very grateful to the team for taking such great care of us from setting up a mini cocktail for the wedding party, and boxing food for my husband and I to take home after the celebration because we didn't have an opportunity to eat during the reception. They went above and beyond, surpassing expectations! Kudos and Cheers to the best venue team! Gorgeous facility, AMAZING food, perfect day. Had my wedding here on 8/18/18 and it was the most beautiful day ever with a lot of thanks to Leonard's. They were amazing throughout the entire process from when we first booked with them until the very end of the night of the wedding. They were always so organized, friendly, professional, and made it fun going there every 4 months to make the payment as they let you view the room and imagine what the day will be like. The day of, the service was phenomenal. The Maitre' D took her role very seriously and was always there when we turned around making sure everything ran smoothy. The food was to die for and EVERYONE at my wedding all said the same thing. Everyone was talking about the food. The room was gorgeous. Got married in the Continental Room and it was so elegant and graceful. Felt like I was in a fairytale. There are plenty of beautiful places on site to take photos. We didn't even have to book a place to take photos because we just did it at Leonard's. 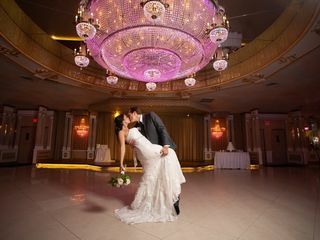 Between the food, the service, and the gorgeous facility, I couldn't imagine why anyone would not want to book at Leonard's for their big day.